At UN on Wikileaks, As Downer & Ging Dodge, Candor at UK Event, Kerim in the Wings? UNITED NATIONS, December 1 -- While Wikileaks was not discussed in the UN Security Council on the last day of the UK presidency, the leaks were a major topic elsewhere in the UN during the day, and at the UK's End of Presidency reception on November 30. Things got more honest over drinks at the UK's end of presidency reception over Park Avenue Tuesday night. A diplomat from a non Permanent Security Council member told Inner City Press that that US Mission personnel had "definitely" spied on this country's political coordinator. 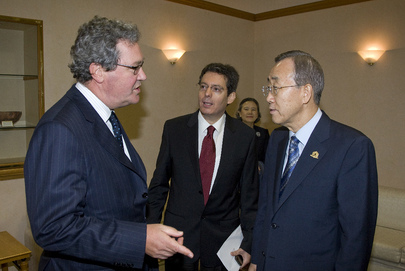 Downer & UN's Ban: one's immeshed in two leaking scandals, the other a target? Reference was made to Iran's piecing together and publication of memos in the US Embassy in Tehran in 1979, and to memoirs by former UK ambassadors in Washington and Uzbekistan. We still need to write, we can't stop, a European diplomat said.